Umit at "The Bourne Ultimatum" movie! 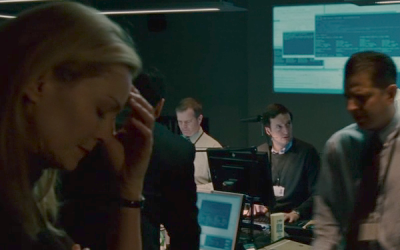 Umit has featured "The Bourne Ultimatum" movie, helping some CIA agents to hack into a mail server. We've put some screenshots of the movie, made by Robert Chui, who first noticed the appearance of Umit in the movie, in our screenshots session. In the screenshot, you can see Umit running in the background using a modified theme, and in the bash window, you can see UMIT written somewhere in the top of the terminal. Hey movie directors! Sit and wait for UmitMapper and NetworkInventory, which are about to be integrated into Umit! I'm jumping on the bandwagon and presenting you with a demo video for the Network Inventory. The video quality is not so good cause I needed to resize to fit on most people screens. Now, to the point. On my last post I said it was all sudo's fault for not creating Scheduler control file correctly, and I was wrong. I wasn't even looking at that problem now, I was continuing with Timeline integration with rest of umitInventory and umitDB but for some unknown reason I just wanted to fix that strange bug. From the previous post: "Running with sudo at console causes the Scheduler to not create a control file at user home dir, but it runs fine and everything that it needs to do is done, except that it can't be stopped by the controller since it didn't create the control file." But what was happening was: I've done a function that checks if a process is running at all, on UNIX, it uses kill for that. So, it was working like this: send kill to the pid with signal 0, if it throws an OSError exception the process is not running... WRONG! Throwing an OSError doesn't mean the process is not running, I needed to check errno also. An OSError with errno equals 3 ('ESRCH') means the process isn't running (errno 3 is 'No such process'), but since I ran the process with sudo it was returning errno equals 1 that means 'Operation not permitted' and then it was returning False and the control file would get deleted and I would think that the control file wasn't created at all. And again, forgive me SUDO. Scan Scheduler has been developed to schedule scans (but it may schedule anything). Almost the same cron format is being used (';' instead of ','), but this will be changed. Each "Scheduled Scan" has an unique profile name that identifies it, and one or more "Scheduled Scan" may use a "Scheduling Profile" (this defines when scans should run) and also has an unique name that identifies it. Cron parser was done already, Adriano did it. Created a "SMTP Account Editor" GUI for creating and managing SMTP schemas to be used inside "Scan Scheduler Editor" for sending emails. As you may know, some nmap scan options requires root to execute. So, I'm still looking for a way on how to start it as root inside UMIT. I've tried using gksu, but then Scheduler will use config files inside root home. Running with sudo at console causes the Scheduler to not create a control file at user home dir, but it runs fine and everything that it needs to do is done, except that it can't be stopped by the controller since it didn't create the control file. Why write yet another Network Inventory ? Before the official start (28th May), I've been thinking about how to make a nice Network Inventory. I did some research and for my surprise, most of "Network Inventories" were more like a Software and Hardware Inventory that gathered information from local network using some win32 protocol that I forgot the name now (sorry). After some search I found PBNJ, nice! At least someone thinks the same way I do about what a Network Inventory should be. But (maybe I could be wrong and I'm sorry for that) it is just impossible to visualize and organize a historic using PBNJ alone, since it doesn't offer a GUI or anything else. Also, I think it would be way too hard to handle many changes in a small to medium network with it. PBNJ author seems to be a good person (I just talked a bit with him on IRC asking for permission to talk about PBNJ for a lecture that I talked a bit about my project, and he was very nice), so I hope he doesn't get mad if he reads this. Other project that I know that does a lot more than I pretend to do in this summer (winter for me) is Splunk, it handles everything you throw at it. Their team have very nice people, talked with them for the same reason mentioned before. So, UMIT Network Inventory comes to help you understand your network(s) situation, with a nice GUI that includes unlimited Historic per device, Search, Scheduler and an eye-candy and useful Timeline, and is Open Source of course. What was done to make Network Inventory exist ? Before the official start I saw that current UMIT database schema would be no help for doing an Inventory. So a new schema needed to be done, flexible enough to handle every piece of nmap xml output  and some other things related to the Inventory. Grabs Inventory Changes by timerange (just started but works already). With this new database, it was possible create and maintain several Inventories. It is still missing some features from latest nmap versions, but this is easily extendable. Man.. let me tell you a thing, since I was announced as an accepted student, I've written around 35.000+ lines of code, and "throw away" more than half (right now on my branch there is 15k+ of my code). The Timeline widget have been written and rewritten several times, always getting better (at least I think) till actual stage. All previous versions never worked with real data, this is, they were never really integrated within Network Inventory. Only this latest version is finally working with real data, and finally it seems I found a good Timeline solution, that accept data in a very flexible format and it is very easy to add new graph "types" to it (right now it supports line graph and area graph). Other key-piece of Network Inventory GUI was the Changes List and Changes Diff (Changes Diff is an improved version of current DiffCompare found in UMIT). Before current Interface, I've tried several things to create a nice historic visualization (I ended up deprecating some of them even before making them to the repository). After all, I think it was really important to try several things to see what goes better. Also, I can't count this as a time waste since it helped me a lot to improve the interface, to improve my thinking on how to handle Inventory changes and some other things. It has been a really good journey, and is still being. More features to come, especially for Timeline, very soon. Ok, so what Network Inventory does right now ? Expect a much better integration with Timeline and the rest of Network Inventory for the following day/week(s). A brand new alpha version of Nmap with some work done by Google Summer of Code students has been released, and Umit is been send along with Nmap and other students improvements. We're hopefull to have more people trying Umit, reporting more bugs and giving us more feedback! If you're curious to know what Umit's students are working on, join us on trying our software and checkout our repository. The student's works are separated by diretories inside the branch dir. indep_features (Adriano and Frederico) - Independent features and bug hunting. joao (João) - UmitMapper. Run a scan, and take a look on the shinny new tab that shows João's radial map of your network. max (Max) - NSE Facilitator. An easier way to play and create your NSE Scripts. umitdb (Guilherme and João) - A new Database schema and module for Umit. Better arrangement, and other stuffs improved. The only thing we're missing is you trying it out, and having fun with us! This week I've been thinking about how to implement authorization in umitWeb. In other words, I've been trying to define a way to determine what users can or cannot do running nmap on UmitWeb (once UmitWeb aways run as root on the server). After a few days, I made a draft that describes how it will work. The mechanism is quite simple: each User will be assigned to a Role, and that role can have several Access Permissions. This appear to be an obvious way to do authorization. But how could access divided in permissions? I found a way that I guess it's interesting: each Role will have definitions about details of command composition. For example, a Role to an user that can execute OS detection will have a permission to execute nmap with the '-O' parameter. In other hand, if a role doesn't have a permission that define the '-sV' command, users assigned to that role cannot do detection of service's versions. The better way to find this option inside the nmap command line is comparing it with regular expressions. There are advantages to use regular expressions to indentify parts of a command. The permission definition can me written in an XML file (like options and profiles), and it can be extended by the user. For example, if a user want to create a new permission definition, He/she can easily do it by editing the security.xml and put inside it the properly regular expression associated with that permission. Other important thing that is important to think is about how umit will handle the permissions order in each role. I think that the best way to do it is 'chaining' all permissions and categorize it by defining a priority order. This way, umit will work like a 'command firewall', filtering the options to allow or deny the command execution. I'm still thinking if the best way to store user roles is in XML files or a database. I have this issue to store users too. I'll realize tests and researches about security issues in each case. Next week will be time to implement my thoughts and test it. Let's roll in the first official GSoC week. Here we go! For those of you who has been following the Umit development, running it from a working copy of its repository, you may have noted that the interface has changed a little bit, and it feel cleaner now. Also, I hope you didn't notice the Crash Report window that is shown when Umit die with an uncatch exception caused by an alien error. These modifications will feature the next Umit version, which is been integrated to Nmap this month, and soon will be launched for testing. This new is worth a post here because Umit has reached again one more milestone, and the quantity of users which will use Umit will increase A LOT after that, leaving us with a good user base for testing and giving us feedback with sugestions, and inspiring us on making an even better tool to make your work faster every day. Soon, Umit will feature brand new features like UmitMapper, NetworkInventory, Profile/Wizard Editor, NSE Facilitator, UmitWeb, and whole load of features intended to make you waste less time working and more time with your familly. That's our goal! So, stay tunned for the next Nmap release, give it a try and let us know your thoughts about it, sending us a bug report if you find a bug or an email if you just want to give us some feedback or sugestion about the tool.